Uziel Guthardt Glass (1923-2002) was born in Weimar, Germany. His family fled from the Nazis to England in 1933, and from there made their way to Israel in 1936. They joined a kibbutz and changed their last name to Gal. From his youth, Gal was interested in weapons engineering, and designed his first automatic gun (which shot arrows) at age 15. 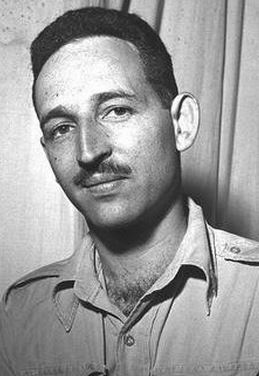 At 20, now a member of the Jewish Haganah defense force, he was arrested by British troops for carrying a gun (forbidden to Jews in Israel at the time) and spent three years in prison. It was during his service in Israel’s War of Independence that he began designing a new, smaller, safer, and more effective submachine gun. In 1951, the IDF adopted his design, giving birth to the famous “Uzi” (although Gal requested that the weapon not be named after him). The weapon was also adopted by over 90 different countries, and became the most popular submachine gun in history, with over $2 billion in sales. It has been used primarily as a personal defense weapon by officers, tank infantry, and special forces units. Most famously, it was the weapon of choice for the US Secret Service – typically hidden in a small briefcase – and was used to save President Ronald Reagan from an assassination attempt in 1981. Along with other military decorations, Gal was the first person to be granted the Israel Security Award. With the high rank of Colonel, Gal retired from the IDF in 1975 in order to take care of his daughter, and moved to Philadelphia for her medical treatment. He continued designing weapons in the US until his passing due to cancer in 2002. In 2003, the Uzi was officially retired by the IDF, praised for its instrumental role in Israel’s many military victories. The truth is, we are all living in Israel. It’s just that some of us haven’t realized it yet. This entry was posted in Law, Politics & Military, Science & Technology and tagged Colonel, England, German Jews, Germany, Haganah, IDF, Israel, Israelis, Kibbutz, Machine Gun, Philadelphia, Uzi, War of Independence, Weimar on August 11, 2015 by Jew of the Week.